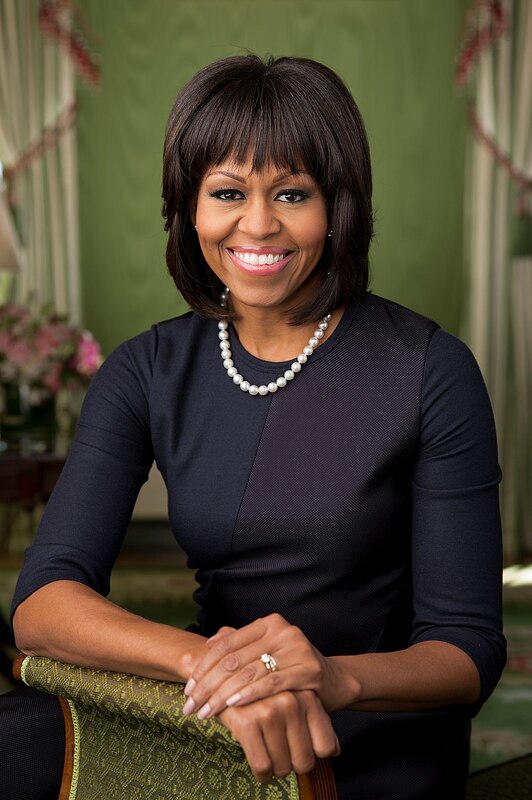 Michelle Obama is an American lawyer, writer, and university administrator. She was First Lady of the United States, from 2009 to 2017. She is the wife of the 44th President of the United States, Barack Obama. Their children are Malia Obama and Sasha Obama. Michelle is the daughter of Marian Robinson (born Marian Lois Shields), a secretary, and Fraser Robinson III, a city water plant employee. Her brother is college basketball coach and broadcaster Craig Robinson (not the actor of the same name). Michelle’s parents, grandparents, great-grandparents, and great-great-grandparents, were all black. She has Gullah roots. Michelle also has some European ancestry on her family tree, with distant English, Scottish, and Irish, roots. One of Michelle’s white ancestors was her great-great-great-grandfather, Charles Marion Shields. Charles was the son of Henry Wells Shields and Christianna Payne Patterson. Michelle’s paternal grandfather was Fraser C. Robinson II (the son of Fraser Robinson and Rose Ella Cohen). Michelle’s grandfather Fraser was born in South Carolina. Michelle’s great-grandfather Fraser was the son of Jim Robinson and Louiser/Louisa. Rose Ella was the daughter of Caesar Cohen and Tira/Tyra. Michelle’s paternal grandmother was LaVaughn Delores Johnson (the daughter of James Preston Johnson and Phoebe Moten). LaVaughn was born in Illinois. James was the son of Ruben “Ruby” Johnson and Carrie Don. Phoebe was the daughter of Nelson Moten and Mary. Michelle’s maternal grandfather was Purnell Nathaniel Shields (the son of Robert Lee/Leacel Shields and Anna/Anne Estelle Laws/Lawson). Purnell was born in Alabama. Robert was the son of Adolphus/Dolphius Theodore Shields and Alice Easley. Anna was the daughter of Nathan Laws and Fanny/Fannie L. Humphrey. Michelle’s maternal grandmother was Rebecca Jumper/Coleman (the daughter of James Jumper and Eliza Tinsley). Rebecca was born in North Carolina. James was the son of Peter Jumper, Jr. and Eliza Wade. Eliza was the daughter of Nelson Tinsley and Nancy Morehead, whose own mother’s name was Eliza. Michelle’s first cousin, once removed, is Rabbi Capers Funnye. Capers is a Jew-by-choice. Michelle’s paternal great-grandparents, Fraser Robinson and Rose Ella Cohen, were also Rabbi Funnye’s maternal grandparents. As stated, Michelle’s great-grandmother Rose Ella Cohen had the usually Jewish surname “Cohen”. Rose was an African-American woman, whose father, Caesar Cohen, was also African-American. It is not clear where the “Cohen” surname originates in this family, or if Caesar Cohen had Jewish ancestry of some kind.